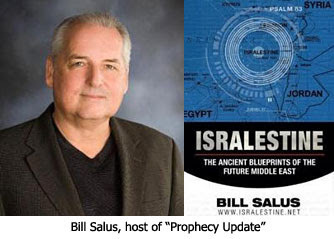 In April I was interviewed by Bill Salus, author of the popular Psalm 83-themed book Isralestine, host of the radio program Prophecy Update, and evangelist on the end times website Prophecy Depot. Bill and I spent much of the interview discussing what I believe will be the next world superpower. The European Union (E.U.) appears to be on the verge of overtaking the United States in world superpower status! End time's expert on international politics and prophecy, Dr. David Reagan, declares the E.U. exists today in fulfillment of Bible prophecies contained in the books of Daniel and Revelation. Furthermore, he says the Antichrist will come out of the E.U. according to Daniel 9:26. Dr. Reagan believes the E.U. fulfills the ancient prophecies regarded with the Revived Roman Empire. In a two part radio interview with Prophecy Update Radio host, Bill Salus, Dr. Reagan explores the prophecies and politics regarding the E.U. Additionally, Bill Salus and Dr. Reagan show how the recent paradigm shift in Antichrist thinking has caused many eschatologists to take their eyes off of the Revived Roman Empire prophecies. Dr. Reagan dispels the Assyrian Muslim Antichrist hypothesis and reminds the listeners that the Antichrist will come out of the European Union, and not the Middle East! In tomorrow's broadcast of Part Two, I temporarily changes hats with Bill and becomes the host of the program. I then asks Bill how soon Psalm 83 and Ezekiel 38 could find final fulfillment. This is a very thought provoking radio show exploring some of the most important prophetic information of these end time's. God Bless Dr. David R. Reagan and Bill Salus for this radio show, with important prophetic information of these end time. Greetings from Nicaragua. Moscow markets self-contained cruise missile platform in easy to move 40' shipping containers. Club-K Container Missile System top opens to reveal 4 missiles ready to launch. Iran, Venezuela and Syria have already shown keen interest. Joel 3:2 indicates that the Land of Israel will continue to be divided even up to the time of Armageddon, oops, that knocks out the Greater Israel. Ezekiel 37:10 makes reference to an exceedingly great army, however in the following verse this is identified as the whole House of Israel, much like Exodus 12:51. Isralestine is a false prophecy, Psalm 83 is a prayer for divine intervention, which will find fulfillment in Ezekiel 38-39. Where are the Bereans, surely they are not among the scholars that endorse Isralestine? The European Union is a financial mess, Greece required a huge bailout, Spain is on the brink. I look for a new power structure to arise, headquartered in Rome, not Brussels. The European Central Banks and the U.S. are intertwined, when we go down, they go with us. I find it rather interesting that several E.U. members had the same housing crisis as the United States, even the loan packages were identical. The European Union is a sinking ship, their military machine is almost nonexistent, they merely supply logistics for N.A.T.O. operations. Time to look elsewhere. You are much better at explaining than me...not so sure if we completely match up on everything but I do appreciate your writing skills. The house of Israel, the house of Isaac, the house of Abraham...the house of Ishmael, the house of Esau...brothers, they are all brothers. How do they find peace? Only thru the Seed of Abraham, thru Isaac, thru Jacob(Israel), thru Judah,etc...finally Jesus(Seed)...Isa...I think that is Arabic. This is happening...many our being saved in the countries around Israel...talk to the missionaries. It is unprecedented. Pray for military peace...if we have war then the brothers will unite...politically...for now they know things are not working...they are searching for something...Jesus. Yes, they know Jesus was a prophet...but they need to know he is the Son of God. Yes, there are some not fun things coming up...but remember Jesus and the great commision. The Gentile Church=Ruth...gives Naomi the Jewish baby. That Jewish baby is Jesus...again. Sometimes it is difficult to get my Greek brain (vs Hebrew brain) around all this. Jill, very good analysis, it is true as the days grow darker, we must continue to seek the lost with all our might. Rodney said... "...The European Union is a sinking ship..."
==>> - Looks like the other leg of Daniel's image has stepped onto the "scene"! If "they" intend to establish 5 northern 'kings' and 5 southern 'kings' [north & south sides of the Med-pond], then this will be the AC's kingdom after Ps83 plays out. "With Israel in a secure position of economic and military power after Ps83-Is17, and with the region in a power vacuum after the Gog-Magog defeat, since now the only 2 remaining mil-powers are Israel and the EU, AC will seek a "mutual" peace accord to protect his power base [and allow him time to build it up further]. This treaty will also includes economic "assurances" that Israel will not squeeze the EU like Russia did with their gas shut down, and also to continue to supply food and other goods." I agree that the balance of power will shift, yet that will only occur in the aftermath of Gog/Magog. The fictional account of a modern Psalm 83 conflict other than that realized in Gog/Magog will not change anything. The concept of a Greater Israel and an Exceedingly Great Army is not only taken out of context, it also requires allegorical applications. The exceedingly great army identified in Ezekiel 37:10 is clearly identified as the whole House of Israel in verse 11. How long will people continue to believe in the false prophecy of Bill Salus as proposed in Isralestine? Wake up, and quit drinking from the same spiked punch bowl. Rodney said: How long will people continue to believe in the false prophecy of Bill Salus as proposed in Isralestine? When it does or doesn't happen. Phillip Goodman at his Tulsa conference this past weekend gave a fascinating take on Psalm 83. He claimed Ezekiel 39:4's "the nations with you" could be the Psalm 83 nations, acting as proxies to the Gog-Magog coalition. He tied this to the safety prerequisite for Israel, claiming that Israel has had more safety now having their own nation in almost 2,000 years, and that no tour to Israel feels it is in danger. Therefore, Psalm 83 could happen simultaneous with Ezekiel 38-39, but that it still will happen. It was a "makes you go 'hmmm'" moment. Bill Salus interprets Saudi Arabia as being the Ishmaelites in league with a coming Psalm 83 confederation. Ezekiel identifies Sheba or Saudi Arabia as not being a participant in the Gog/Magog confederation, only joining with the West in a diplomatic protest to the ensuing invasion. Therefore they can not be the same if we follow the interpretation of Bill Salus that is. The scale and dimension portrayed by the Prophet Ezekiel when describing this vast confederation of forces known as Gog/Magog is so great, obviously Israels' neighbors will be involved, that is a no-brainer. This conflict is coming very soon. Russian President Medvedev is meeting with Assad of Syria and will soon arrive in Ankara to meet again with the Turkish Prime Minister. While the talk of peace is in the air, the enemies of Israel and the United States are preparing for War at rapid pace. The Arab League meeting in July can be expected to bring forth a formal declaration of war and the withdrawl of all U.N. peacekeeping forces in the region. July-August is the Jewish month of Av, also known as the time of ripening for fig, olives, and grapes. Most of you should be familiar with Jewish History and the 9th of Av. It is interesting to note that seven months from the month of Av, we come again to the time of the Spring Feasts (Abib;Nisan), such as Passover, when Elijah the Prophet is expected to appear. The following month is the month of Ziv (Iyyar) or the second month on the sacred calendar, when the foundation of the first and second temples' were laid, quite possibly the third will also be laid at this time. And seven months shall the house of Israel be burying of them, that they may cleanse the land. Yea, all the people of the land shall bury them; and it shall be to them a renown the day that I shall be glorified, saith the Lord GOD-Ezekiel 39:12-13. See also Jeremiah 16:14-19 and Ezekiel 39:27-28.